It is extremely rare for a state government and the Centre not to see eye to eye over the visit of a top functionary of a friendly country. But that is exactly what has happened in Punjab over the four-day tour of Canada's defence minister Harjit Sajjan, which starts from April 19. While chief minister Amarinder Singh has called Sajjan and his Sikh colleagues in the Canadian government pro-Khalistan sympathisers, the ministry of external affairs has called him a war hero. Amarinder Singh too, resigned from Congress after Operation Bluestar. In those days, anyone who did that was called Khalistan Sympathizer, CIA agent, Anti national and what not. Coming to the Canadian Minister, if he is a Khalistan Sympathizer, good chance to turn him around. The govt could use Illustrious Dr. Swamy* to turn around a few. yes , but the khalistan movement is strong among canada's sikhs . he could be right about the defence minister . Then, rather than let the Canadian Sikhs live in their own world, it may be worth trying to turn them around. Why not start with the defence minister. Some news item in those days told that Kuldeep nayar who was appointed by VP Singh as ambassador to UK had weakened the Khalistan support there. Though still a bit is seen now. Finally the minister has denied sympathizing Khalistan. Defence Minister Harjit Sajjan calls it "ridiculous" and "offensive" that a magazine in India is accusing Canada of being complicit in a rise in Sikh terrorism. Sajjan and fellow Sikh minister Amarjit Sohi are making it clear they neither sympathize with nor espouse the Sikh nationalist movement, which is bent on creating a separate country called Khalistan within India's Punjab region. 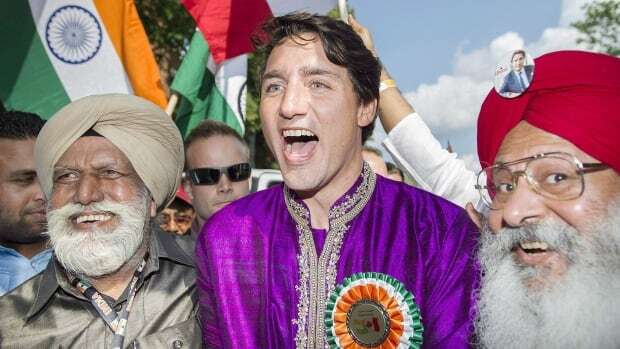 Some of my Punjabi friends in Canada, especially Sikhs are now wary of Trudeau for his ultra-Liberal approach to letting in millions of Muslims. I find him exactly like Congressis in India. Wear topi, hat, whatever and visit all places of workship.. quite unlike any gora politician.. Also, I don't get silly obsession with multicolored 'cheesy theme' socks. Its funny these punjabi friends are wary of Trudeau letting other Muslims in. I mean, arent Punjabi's immigrants too? As such, if you are talking about eventual and inevitable home grown terrorists, then I think it will largely depend on Canada's relationship with other countries. As a country, be in Liberal or Conservative party, they havent actively participated in any recent wars, unlike US. Its a chance I suppose his party is taking in letting people in. I am yet to see a Muslim family in my life stop at 2 kids.. goras and others (non-muslims) are having 1 to 2 kids. After 40-50 years you will have Muslim presidents in Canada, USA, Germany, etc.. end of story. I am not too sure about that Sane. I mean, historically Canada has not been an aggressive nation. It always stayed in the shadows, unless that changes in the future. What could be the reason for terrorists to grow at home? I mean, what is the motivation? lol something Russel Peters would say, soon there will be only one color. Beige (like Asians). and then there will only be one religion. aise to, not many terrorist motivations appear rational. people don't need a valid motivation to mis-interpret their religion and wanting to enforce it using violence to make people submit to their aims/desires.. I mean, arent Punjabi's immigrants too? Some of them are 2nd or 3rd generation in Canada.. it's all about who came first (French and Brits too landed in North America in the last couple hundred years only), sometimes even a few years matters in such arguments.